Knitscene Winter is the perfect magazine for cozy knits with 24 knitting patterns worked in delicious yarns, tubular cast-ons, and a look at international designs. For most knitters, winter is the best season of them all—time to knit cozy cardigans and warm pullovers in the best yarns to be found. Knitscene Winter is the perfect magazine for those knitters, with 24 must-knit projects worked in delicious yarns that make the process thoroughly enjoyable. Knitscene Winter 2013: The perfect magazine for cozy knits with 24 knitting patterns worked in delicious yarns! Featured designer Ruth Garcia-Alcantud gives us the first ever international designer collection. 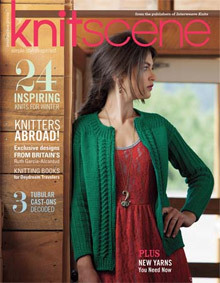 Plus, enjoy yarn reviews, new knitterly products, and stylish photographing in every issue of knitscene. Cozy Up! Order your copy of Knitscene Winter 2013 today! WOODS: Celebrate earthy colors and organic stitches with woodsy knits with unique details. REGAL KNITS: Whatever shade of purple, these berry knits are elegant with feminine details. International Designs: See Ruth Garcia-Alcantud's mind at work with these inspiring designs. Order your copy of Knitscene Winter 2013!